Othello - Description | W. W. Norton & Company Ltd. This Norton Critical Edition includes the First Folio text, along with an introduction, explanatory footnotes, note on the text and textual notes. 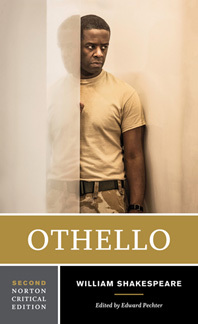 Giraldi Cinthio’s story—which Shakespeare used for both the plot and many details of Othello—is included here, as is a generous selection of interpretative responses to Othello, new to this edition are those by Stanley Cavell and Lois Potter. Edward Pechter’s theatrical and critical overview has been expanded and the bibliography has been updated. This Norton Critical Edition of one of Shakespeare’s best-loved comedies is based on the First Quarto text with variants from the First Folio. A tragedy that evokes both pity and terror—now in a thoroughly revised and updated Norton Critical Edition.